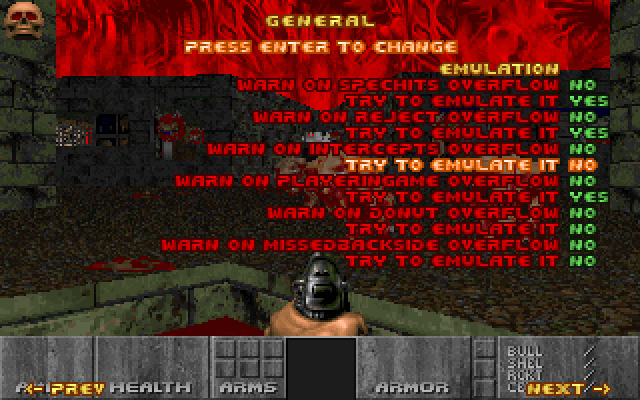 My new wad (Map01, to be precise) for doom2.wad & PrBoom-Plus (at least), with complevel 2 (and .OGG-music support). No jumping or crouching allowed. This is first chapter (of a trilogy), for just as with the first 3 Urotsuki wads, there will be 3 chapters. Though I didn't finish in that attempt because near the end I started to noclip in a weird way. I have no idea what happened and why. I really loved the map. Very atmospheric and also creepy sometimes. If you got "noclip" bug, just go to game zone, save the game, and load it. I don't understand what it is to. You can set this option to "no" and say goodbye to that bug. There is really no point in emulating it unless you're doing something extremely unusual. Thanks! I didn't know about that bug. Sure. Because you don't talk much. We talked about it before, remember? Absolutely delicious WAD. I was actually pretty afraid around the Object 15 area, I was expecting something, anything to suddenly happen. What does the Russian text in a wall near the exit means, though? Seems that it is a part of a song. Someone believes in everything at once." I replayed the map (also to find the secrets, I was very close in the first attempt heh). And I gave another run to the first trilogy. That one it improves on every map, and it seems that the second is even better too. I think that the things in the new trilogy (as it started) are set and defined in a better way. Can't wait to see the next chapters! I played this the other day as well, could've sworn I recorded an FDA but can't seem to locate it now, unfortunately. Was able to finish with no problems, but it did end up taking a while, both because the map is larger than I was expecting and because it's rather slow-paced. I think the strength of the Urotsuki maps is the setting and atmosphere, and it holds up well here. Upon finding the pit of smouldering ashes with an abandoned military base built up around it, I had a cool "oh yeah, THIS thing" moment when I realized that it's the same pit from way back in the first series (in turn suggesting this is the same geographic location, only many years later or even earlier in the timeline), presumably being studied as one of your SCP-style "Objects." That kind of depth of implied narrative and lore is of course quite rare in a wordless game like Doom, and it never ceases to impress me how you're repeatedly able to find ways of pulling it off. Dig the eerie unnatural quiet around the area too, maybe counterintuitive from a traditional gameplay/mapflow perspective, but suits the mood quite well. And I suppose that's my biggest criticism--where the traditional Doom gameplay of fighting monsters actually exists, it's usually really really dry and uninteresting, not something I'd normally put up with if the setting weren't so cool. You've got these big/spacious but mostly flat areas that have high-HP monsters dotted around in them, such that you generally only encounter them one at a time and usually from the front, and you grind through them one after the other all through the whole duration. There's very little zest or variety in the combat, with few or no traps, no setpieces, nothing to require you do anything more than stand and shoot--I think the most notable moment is probably the surprisingly large number of revenants which pour out of the large stone hall sealed off by the wooden door with the B0S insignia on it, an idea repeated later with the last herd of totally ineffectual pinky demons. A few parts of the map have problems where you inevitably end up fighting protracted battles through doorways or other thresholds as well, usually that's a recipe for player ennui. Not every map needs to be combat-focused in order to work, of course, and so I suppose what I'm saying is that I think this map would probably be more enjoyable if it actually had less/lighter combat than what it currently does--give the player some light skirmishing against groups of weak monsters occasionally punctuated by heavier moments (e.g. the aforementioned hall-revenants) and I think the whole experience would fare better, as is you spend so much time grinding away at large-yet-unthreatening targets that it sort of bogs down the pace and detracts from the experience of exploring the weird setting. Then, about the pit with fire and ash: It's just a incinerator, I made it like that in 5L1C and Inferno Road. So, that's not a same locations. BUT! Level have a really many metaphors and meanings. You may try to visit RDC and read some discussions about it. But you'll need a Google translater, you know. Also, about gameplay. Yes, I can't making really good gameplay. 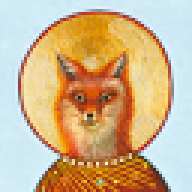 Perhaps, the reason of it is a fact that I'm mostly a designer, than a GAME-developer. But I'll try to make a gameplay better in next chapters. Lanios, I can help you a bit. presumably being studied as one of your SCP-style "Objects." To understand this, Google SCP Foundation Wiki. It has a Russian language site as well. Lainos I love your maps. review is up. 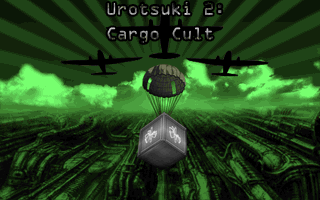 i like the new direction of the urotsuki series. ^ the wad has been already uploaded to idgames.